In the modern world of ultra premium cigars, Davidoff is best known for its "White Label" collection of cigars, consisting primarily of mild to medium-bodied blends geared towards the sophisticated palate. Of these "White Label" cigars, the Davidoff Signature is the most delicate. However, unlike most other traditional brands, the Signature is assembled from multiple blends. Essentially, Davidoff has combined past brands, including the iconic Mille (dating back to 1976) and Classic series. This makes for a wide variety of flavor profiles, with nearly every cigar in the collection carrying its own, unique character. What remains consistent throughout the lineup is the Dominican tobaccos at the cigars' core. 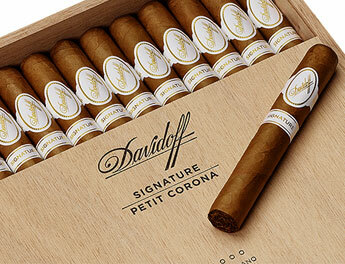 Davidoff Signature cigars are renowned for their soft complexities and clean, refreshing finish on the palate. The cigars are mild in body, with flavors ranging from buttered toast, cream and floral attributes, to earth, cedar, and raw sugar cane—a refreshing experience that suits life's most engaging moments.